Two passengers on the bus. One was clearly younger than the other. I could tell from their skin. The younger one appeared in her twenties. Smooth, clear skin with just a light touch of make-up. She'd easily be considered pretty, if not beautiful. The other woman was much, much older. Hair dyed brown, not quite covering all that silver-grey. Skin tanned and wrinkled. Was she considered pretty or beautiful when younger? Some people might be born beautiful or handsome. If not, then some measure of beauty could be achieved through cosmetics and science. Still, the passing of time ultimately robs skin and muscle of the potential to appear beautiful. Our minds are a different matter though. The possibility always exists that minds will become more beautiful with age. Nice of Mongobear to drop me an email, letting me know that he used this sample (from Twilight 2008) in his performance poetry piece. 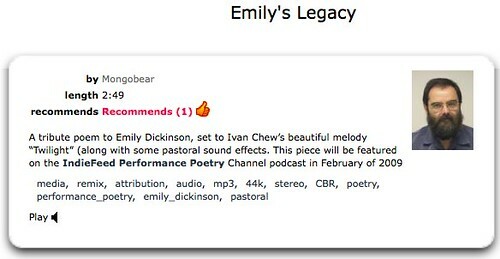 Mongo intends to feature that piece at the IndieFeed Performance Poetry Channel podcast (in Feb 09). He's been working on that project for over three years. They will reach their 500th show soon, and have well over two million downloads during those three years. You can find their feed by searching for "poetry" in iTunes. Mongo says they are usually number two or three in the podcasting section (IndieFeed Performance Poetry). Pretty amazing poets featured. They perform their works with passion (some read aloud, some sing). Incidentally, Mongo has worked in libraries before and says he likes to keep an eye on information management issues. This post's title came from words uttered by nine year-old Tyler from California, USA. Reading this New York Times article, I wonder how many Singaporean kids are like Tyler. Perhaps we'll be referring to them as the YouTube-generation rather than the Google-Generation. Similarly, when Tyler gets stuck on one of his favorite games on the Wii, he searches YouTube for tips on how to move forward. And when he wants to explore the ins and outs of collecting Bakugan Battle Brawlers cards, which are linked to a Japanese anime television series, he goes to YouTube again. While he favors YouTube for searches, he said he also turns to Google from time to time. I think the most obvious response from public libraries would be that being part of the "Google generation" doesn't necessarily mean that one is an expert searcher (check this out). However, this does not address the fact that while Tyler's behaviour may not be mainstream (yet) his preference for videos is reflective of how most people learn best via multi-modal: watch, hear, read, and do. With services like YouTube, this trend -- of searching for multimedia content first -- can only increase. I was inevitably drawn into it. After I bought my bass guitar, I wanted to borrow some books from the library -- the same way I've done more than a decade ago when I was teaching myself how to play the guitar. (Actually my preference would have been to learn the basics from another bass guitar player). The library was closed and my computer was switched on and connected to the Internet. I searched via Google (not YouTube; guess I'm still "semi old-school") and found this site (from ExpertVillage.com). Within minutes, I was progressively introduced to various ways in playing an electric bass guitar (today, they have a YouTube channel). From then on, I've not picked up any books on playing the bass guitar. Does that mean the library is irrelevant? In my case, it's unlikely that I'd look for materials at the library. And I'm speaking as a librarian. I emphasise "my case", as learning needs differ from person to person. However, my gut-feel says most bass guitar players in my position won't really want to look for more references on "how to play bass". What I need most is to practice. Rather than find more things to read, I'd prefer to jam with like-minded bass players to pick up tips. It's unlikely that I can find bass players that easily (not to mention finding the same time to meet) so no surprise that I'll continue to turn to YouTube videos. Like public libraries, the content is free to use. But unlike the library, YouTube videos can be accessed anytime, On-Demand. Public libraries can -- and should -- continue to bring in quality materials on the subject. But we should not keep saying "our content is more credible and authoritative". To me, that smacks of elitism and denial. I feel public libraries should try to compete with the likes of Google and YouTube by trying to bring in "more" or say that we have "better" content. We first have to acknowledge that in certain areas, the Internet offers far richer and more accessible content than public libraries can. Find out what those subjects and areas are, and work our selection policies around it. Bring our booktalks and New Arrival alerts to services like YouTube. The librarian can post a video (e.g. introducing a book on playing the bass guitar) as a "video response" to a Youtube video on playing the bass guitar. Notice I wrote "Librarian" rather than "Library". I'd suggest it's more effective to have a librarian post a response rather than an institution. Although both are ways to publicise the library collection, the latter seems more like blatant advertisement in my view. I've no videos to show what this sort of video should look like. As it's not the mere transposing of a written review to video format, then something simple might suffice. Like, a librarian introducing a book on playing the bass guitar, highlighting why its worth checking out. The video doesn't have to win Oscars. Just offer it in good taste. Perhaps more interesting would be to video a librarian with an actual bass guitar, performing techniques from the book. Or offering suggestions by sharing the experience from learning from the book AND from YouTube videos. That was a fancy way of saying "start a club for people interested in music". Libraries are typically associated with book-based clubs. I think it's high time public libraries venture into "activity-based"ones. A club for bass guitar players would be too narrow in focus. But why not a "amateur musician club". This could be facilitated by a librarian or a library volunteer. Each session would be a mix of loosely structure talks and demos (I'm reminded of meetups like the Singapore Ruby Brigade, WebSG, and what Kevin shared at the library). Although I'm not interested in developing my bass playing skills in the immediate future, that doesn't mean I'm not interested in picking up additional tips from people who play bass. More important, I'd like to meet like-minded musicians, particularly "my own kind", i.e. working adults who dabble in music on the side. The popularity of Google and YouTube are problems for the library -- IF we do not do anything in response to them. But if we review and adapt our service offerings by leveraging on those services, I'm confident public libraries and librarians will continue to have a place in a networked world. I can't help but think that when some librarians make disparaging comments about Internet resources, they are actually saying "I don't like my job being threatened". The truth is, we can see Google and YouTube as threats or as opportunities. If it's more of a threat than opportunity, then librarians have to be open to the possibility that we will be fewer in numbers -- and plan accordingly. Maybe that sounds bleak. I call it "being prepared". Still, I don't see the future of librarianship as bleak. For now, I see Google and YouTube as friends of a librarian. And I'll continue to refine my guitar playing. Librarians in the Scottish community of Edinburgh are being re-styled from "librarians" to "audience development officers". A link to an opinion piece, reflecting on reasons why Americans don't read. The articles were interesting by themselves. Together, I see them as issues that relates broadly to the role of librarians. The current brand name isn't that bad, is it? Nowadays, I don't mind what I'm called (although I used to, but that's another story) -- as long as the library patrons/ users understand what the term is about*. I can understand the intent in choosing a new professional title because few people understand what is it a librarian do on a daily basis. A new name might be a better representation of the job scope but "Audience Development Officers" needs a rethink. The term is too generic and too vague, and hence counterproductive. The term "Librarian" may not be well understood but at least people can associate it with "Library", which is largely a positive association (I hope). Also, in coming up with a new name, you'd need to spend efforts on branding. Might as well spend that money and effort building on an established brand like "Librarian". Granted some people may not think very highly of librarians (as QQ*Librarian points out here) but compared to decades ago, there's less negative association with it. So I think it's about engaging in a holistic brand-building exercise, including a review of services and products. A mere name-change cannot effectively communicate what roles librarians perform and its relevance. The truth is that the decline of reading for pleasure has little to do with the things that teachers, librarians and parents seem to think are causing it. The majority of American adults are literate, and high school English curriculums are meant to teach them to analyze literature, not enjoy it. Unlike, say, watching a movie, reading a book is necessarily a private experience. No matter how similar your opinion of a book might be to someone else's, your experience of reading it will be different. Reading groups don't make reading a public experience; they're a place for people to share their personal experiences of a book. Calling reading an "anti-social" experience seems harsh to me. More accurate to say it's a solitary-experience. But that doesn't invalidate what Justyn is saying. I agree with Justyn's observations that we cannot force people to read for pleasure. But I feel strongly that it's the role of public service librarians to create the environment and sell the idea that reading can be something pleasurable and enjoyable. Librarians can be educators and trainers, but I don't see our roles in promoting literacy per se. We should be promoting reading and the broader scope of learning for pleasure (be it involving print or digital sources). And as Justyn infers: in trying to promote reading, parents, teachers, and librarians have to be mindful that we, in our good intentions, do not inadvertently discourage reading as a pleasurable activity. Members with unpaid library fines and fees will have their borrowing privileges disrupted. They can immediately start to borrow again once they pay up the outstanding amount. With this policy, members can no longer accumulate unpaid library fines and fees. The change will not affect the majority of members who return their borrowed materials on time as well as those who are prompt in paying their library fines and fees. Also stated in the press release: "Members who return borrowed materials promptly will not be affected and the policy changes will not cause any additional burden to the general public financially." From April 2009, members who have incurred library fines and fees above $0.30 and outstanding for more than three months will receive reminder mailers. An administrative charge will be levied on recipients of repeat reminder mailers. In addition, NLB will display reminder messages on loan receipts and on the screens of borrowing stations and library eKiosks to remind members of unpaid library fines and fees. Members are also encouraged to sign up for NLB's free email or SMS notification and reminder services to receive alerts on impending due dates and overdue borrowed items. The policy changes and the improvements to the notification processes are the result of NLB's review and consideration of the feedback and suggestions by members of the public during the last Mass Reminder Mailing Exercise. Personally, I feel these two policy amendments does greater justice to the majority of NLB members who have always returned their items on time. I mean, it's only fair that those who receive repeat reminder notices should pay for the extra costs -- not members who return items on time. The good thing is that now, everyone gets to renew items for free. Of course forgetfulness is a human trait. Which is why it's a good idea to sign up for the free reminder services. 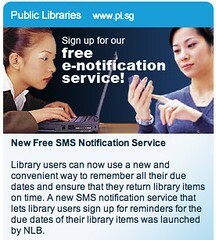 You can receive reminders and alerts via email or SMS. Depending on what you sign up for, you'd get reminders on when your items are due, confirmation for the items you've returned at the bookdrop, alerts that your reserved items are ready for collection, notifications on the cost of lost/damaged items (if any), and expiry of your premium/foreign membership. I chose a 7-day daily reminder, so that if for some reason the system fails to send out a reminder, I'm likely to still get a reminder within my due date. When you return items at the bookdrop, there's an indicator light that tells you if the item is successfully returned or not. The email/ SMS confirmation notice serves as documentary proof, in case you ever need it. It's also useful if you get someone else to return the items for you, and you wish to receive direct confirmation [if you're thinking that email or SMS notices can be faked, the library has other ways to verify]. (Hmm... maybe we need one more type of alert: of items charged to our account. Could be useful as a record of items borrowed and/ or notice of unauthorised use of the library account). With all the alert services being provided for, I think ultimately we who borrow items from the public library must remember one thing: "Personal Responsibility". First song for the year, from my band buddy and I. It's pretty obvious both of us are Joe Satriani fans. First conceived by Adrian Loo. Arrangement by Ivan Chew. Adrian Loo: Drums and distortion guitars. Ivan Chew: Lead guitar, bass, additional percussion, sound engineering. Stroke Of Midnight (2009) by Starfish Stories :: The Band is licensed under a Creative Commons Attribution 3.0 Singapore License. Based on a work at starfishstories.wordpress.com. Permissions beyond the scope of this license may be available at http://starfishstories.wordpress.com/contact-the-band/. Details of how the song came about, here. "Singapore - Crossroads of the East 1938"
The narrator sounds "uppity" and stereotypically stiff-upper-lip British. He pronounced "Malay" as "May-Lay" (the way we say it sounds like "Mer-Lay", without the pronounced "r"). That was a time when Singapore was owned by the British Empire. "Singaporeans" came into existence only 27 years later. When this part of the region was known as "The Far East" and "The Orient". Its inhabitants commonly referred to as "Orientals" and "Occidentals" (you hear that in the video). Footage (at 1:50 min) shows bi-planes -- "the finest and most efficient air force in the Far East". 2:40 min - cloth covers for the vehicles "to protect motor cars against the direct days of the equatorial sun". Rarely practiced today, now that there are sheltered or underground carparks. Even cars parked in the open seldom do this. Interesting scenes of old time Singapore -- coolies, rickshaw pullers, bullock carts. Clothes hung out to dry on bamboo poles (still practiced today). The Singapore river was still full of bumboats then (5:45min). The policemen wore shorts in those days (lol -- local joke). Coolies (6:30min) carrying sacks rice and other bundles on their shoulders and backs. I tried imagining doing this, 6 days a week (how many days did they work then?). They have such lyrical and poetic way of narrative: the ending called Singapore "the mighty guardian in the East" (10:50 min). That mighty guardian lost Singapore to the Japanese in 1942. People like my father would have sung four National Anthems, in this order: God Save The Queen, Kimigayo, Negaraku and finally, Majulah Singapura. Thanks to Ai Lin of Singapore Heritage, for the alert on that video. At a party hosted by a successful hedge fund manager, (the late) author Kurt Vonnegut remarked to fellow (late) author Joseph Heller that their host made more money in a single day than what Heller earned from his successful novel, Catch-22, over its entire history. Heller replied, "Yes that's true. But I have something that he will never have." In light of the global economic downturn, I thought this would be a nice first-post for 2009.